Foreign league winners and runners-up will enter at the fourth round stage. The champions and runners-up of the Welsh and Northern Irish leagues will play in the 2016/17 Challenge Cup as part of a drastic revamp of the competition. 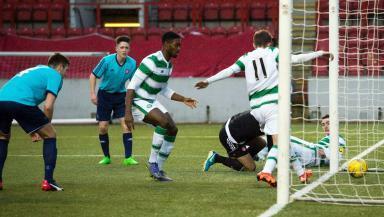 The tournament, which has previously only been contested by Scottish lower league outfits as well as Highland League and Lowland League teams, will now feature Premiership U20s teams. Plans were recently approved at an SPFL board meeting and have been given the green light by European football's governing body. In a document sent to clubs, the league said the move would be used to test the water for future "cross border competitions". SPFL chief executive Neil Doncaster said: "We are also very pleased to be supported by UEFA in delivering an element of cross-border competition through the invitation to our colleagues in Northern Ireland and Wales which brings a completely new dimension to the Challenge Cup and the levels of excitement and interest in it." Top flight reserve sides will enter at the first round with Welsh and Northern Irish sides coming in at the fourth round. A TV deal is in place for all three countries for the latter stages of the competition, which was won by Rangers last term. A new sponsorship deal is also due to be announced with the draw set to take place on June 14. The move is the latest in a series of changes in Scottish football following the merger of the SPL and SFL in 2013 to create the SPFL. With the league competition now in its fourth year, significant changes have been made to this term's League Cup with the introduction of 'regionalised' group stages as well as the competition's final taking place in November. 28 teams will enter in the first round: 12 Premiership U20s, teams placed 3-10 in League Two as well as 4 Highland League and 4 Lowland League teams. First round games will take place on August 2 and 3. Fourth round: 12 winners from round three, 2 teams from Northern Ireland, 2 teams from Wales. Draw will be regionalised to keep Northern Irish and Welsh teams apart.